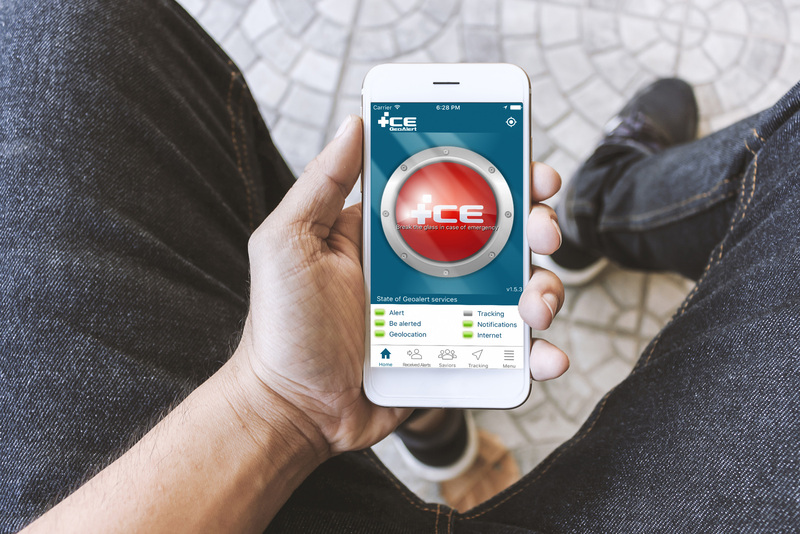 The ICE device receive your alert and then immediately and automatically forwards it to your "saviors" by a notification with an alert sound on their smartphone, and by mail. 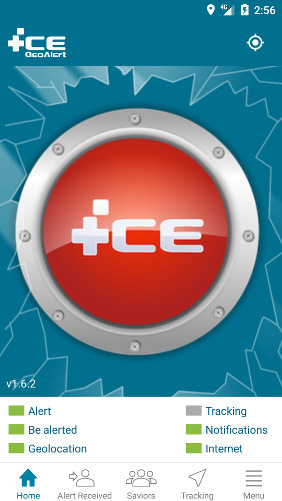 ICE GeoAlert makes it easy to immediately inform the "saviors" you chose of your emergency. 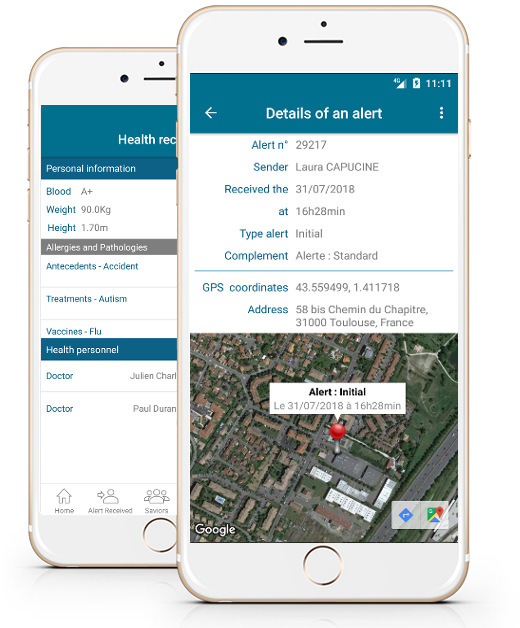 • A web application so that you can register, set your profile, invite your person to contact in case of emergency, or else mention your allergies, current treatment or illnesses in order to help the emergency services along. 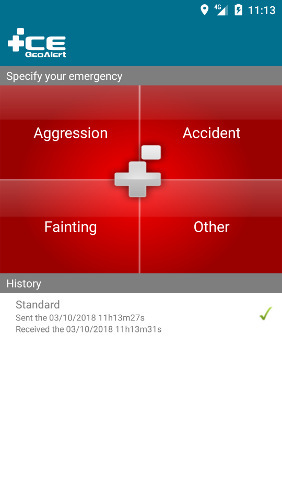 • A mobile application (Android, Iphone) where in 2 clicks you can send an alert and report an incident to a professional by attaching a photo or a video. How do I send an alert ? 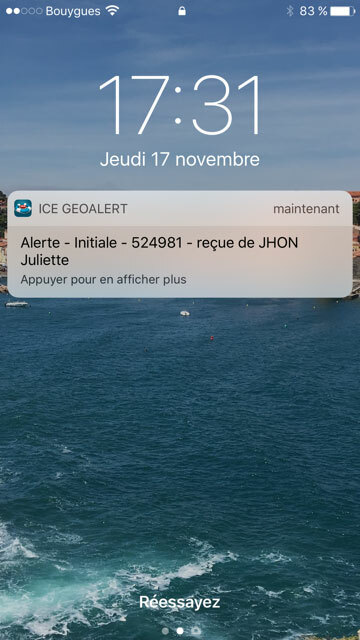 After the download of the ICE GeoAlert application on my smartphone, I send an alert with smartphone by clicking on the red button. In 2 clicks I break the glass and press the button. What is a Savior ? It is a person you chose to contact in case of emergency. We advise you to have have a few people. They can be actual people (family, friends) or organizations (private company, public utility) you have previously set into the ICE device. What is a warner ? The warner is the person who chose to send an alert to you in case of emergency. This person can alert you only if you have previously accepted the request you received by mail, or directly on the ICE website. 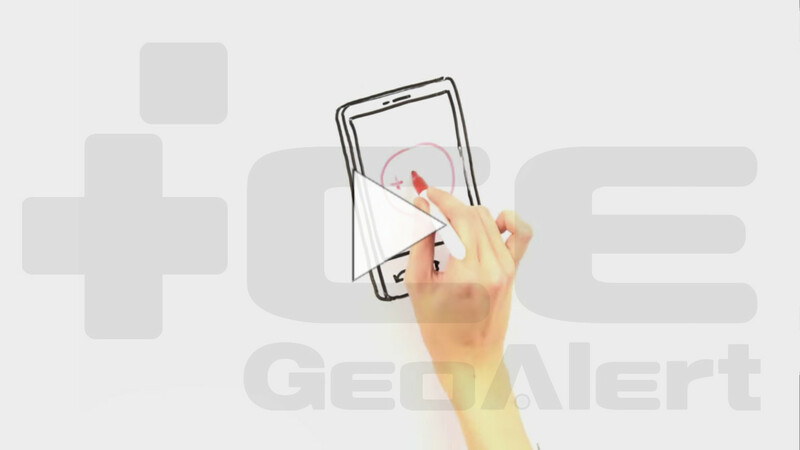 Geolocation is the identification of the real-world geographic location of someone involving the generation of a set of geographic coordinates (latitude and longitude coordinates). 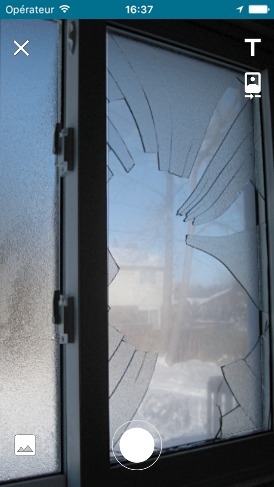 When you send an alert with ICE, your geographic location forwards to your alerted people and is recorded into ICE. 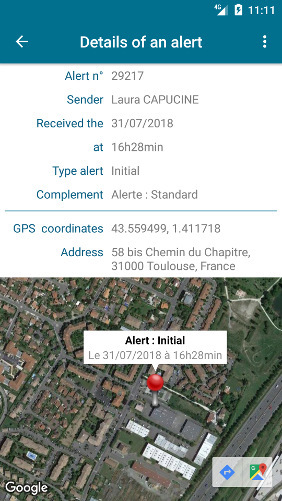 What is a GeoAlert ? 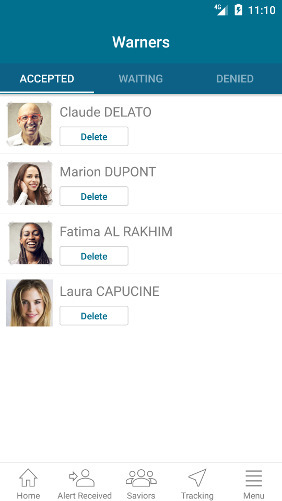 It is an alert sent by a smartphone allowing the identification of the person in distress. What is a report ? 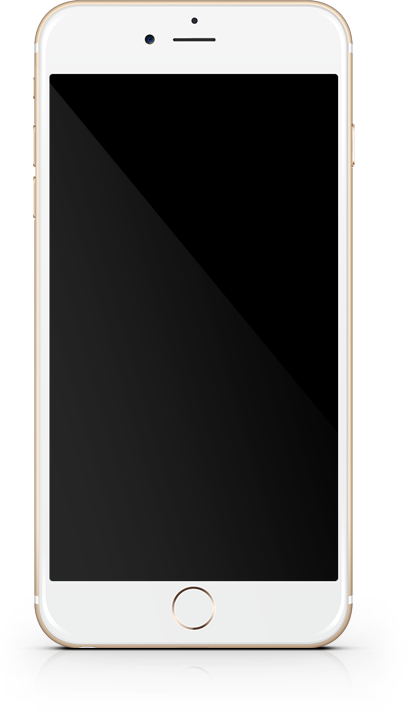 The report makes it easy to immediately inform a professional in charge of the surveillance of a geographic area, by sending a geolocated information : text, photo or video. The report allows him to quickly react and provides more safety. The report does not affect the alerted people you chose. Use the orange button to send a report. 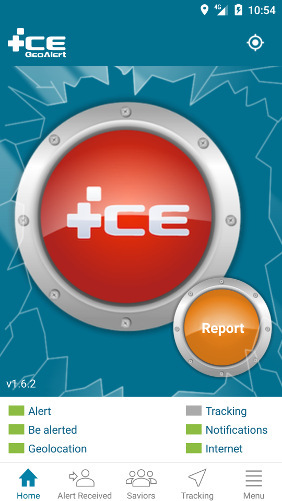 In 2 clicks break the glass and press the “Report” button. 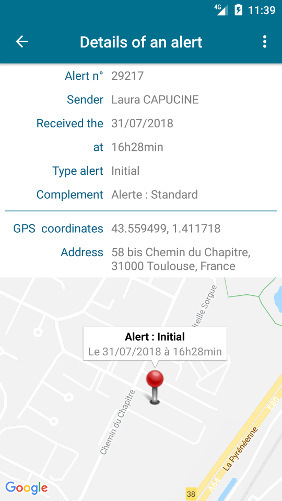 What information I share if I send an alert ? One can use all of these at the same time. When to send an alert ? 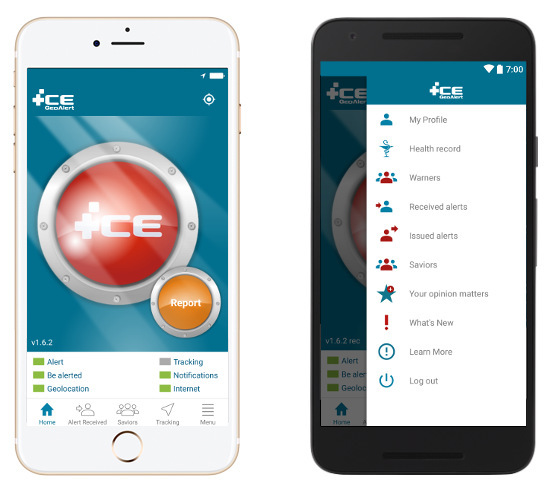 In case of emergency when you want to inform your family, friends, or anyone else who could help you, you can use ICE GeoAlert. e.g : you just had a car accident : you send and alert. You are instantly located and your family/friends (alerted people) can immediately get to you. What is the tracking mode ? 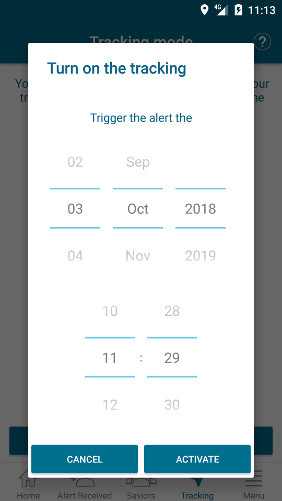 Whenever you go hiking or on a walk in the street and you don't feel safe, the tracking mode allows you to set up the time when ICE should send an alert if you did not stopped the countdown. 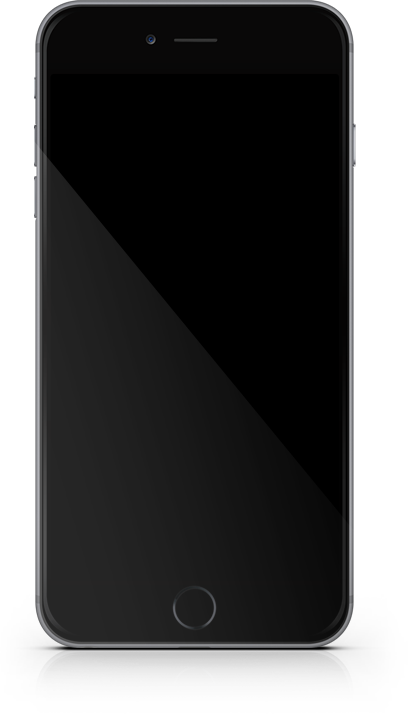 When the tracking mode is enabled, ICE regularly receive your GPS location and in case of emergency your list of alerted people will be able to access all your GPS location previously recorded. What information I share if I send a report ? 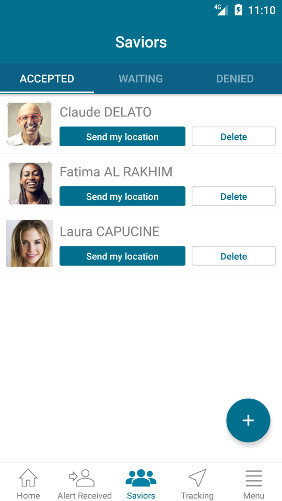 • Enable the tracking mode so that the saviors you chose can access all your GPS location in case of emergency. Super. Un peu de sécurité pour les sportives. Merci beaucoup. 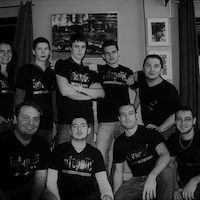 Bonjour, super application que mon épouse et moi venons de découvrir au travers d’une émission tv. 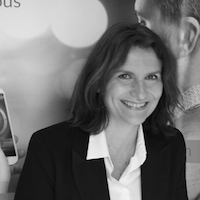 Nous l’avons testée et en sommes très satisfaits, nous cherchions effectivement une telle application depuis quelques temps. Merci pour ce travail et le service rendu. Bien cordialement. Bonjour, Super application bravo à vous ???????? The goal was to make a free app for private individuals to send alerts, for everyone and operating in every country. 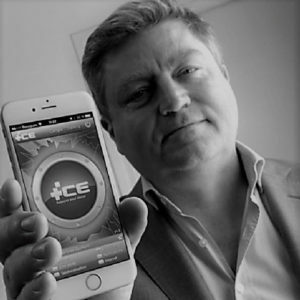 Advanced developer on ICE GeoAlert since the beginning. 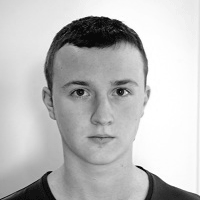 He analyses, designs, programmes for the iOS version, Android or Cloud. 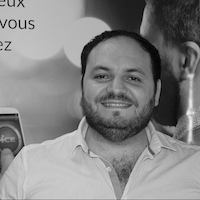 Developer Back-End or Front End, he develops the Android version. 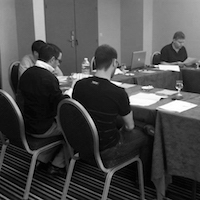 and Benjamin, Adrien, Théo, Merlin, Guillaume, Pierre et Pierre, Alexis, Fabien, Olivier, Romain, Franck, Lisa and Lisa, Mathilde.